The Netherlands may not be the first country you think of when custom motorcycles come to mind but to say the Dutch are kicking arse and taking names in the bike building world in 2015 is an understatement. The city of Utrecht is home to one such builder and although 33% of all journeys in the city are taken on a bicycle, Wrench Kings like their bikes to have more than one human power. 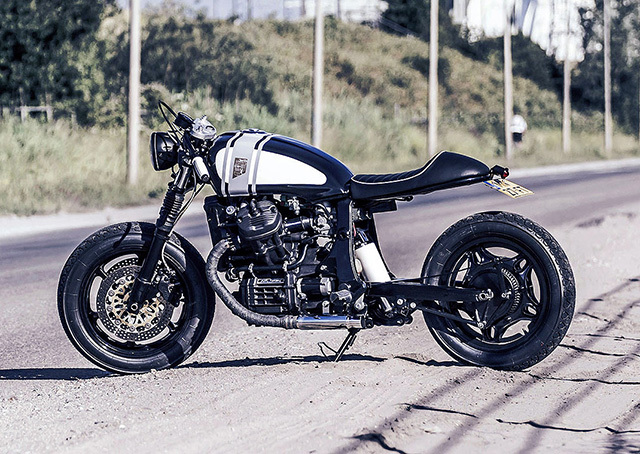 This particular 1982 Honda GL500 is one of their best builds to date with inspirations coming in the form of a B52 bomber and a couple of beers. Which is how Wrench Kings came about to begin with, three friends – Joost, Bram & Laurens – enjoying a few cold ones in a carpark while tinkering with a bike… in Dubai. 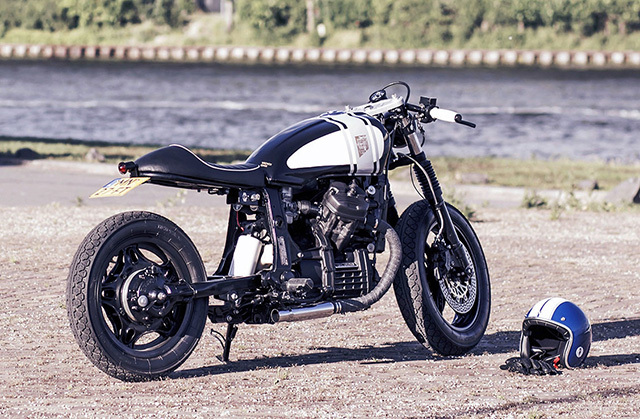 At first glance many mistake the GL for a CX500 – which has become a bit of a cult hit in the café racer renaissance – while the GL does use the CX engine, it’s a larger bike designed for those who love their touring, featuring Honda’s Pro-Link suspension and an all-new chassis. The GL500 came to Wrench Kings HQ in a fairly unloved state, some rust, a lot of oily grime and in need of a thorough overhaul. To do it justice the boys took the bike back to the bare frame and started by fabricating an entirely new rear end. The stock subframe was cut off and a new piece fabricated that mounts to the backbone leaving a huge amount of negative space between the swingarm and seat giving a drag bike like appearance. All of the excess body work is gone, the two up foot pegs, the radiator shroud off to the nearest bin and the frame completely smoothed and detabbed before being coated in black. Just like the CX the GL500 has one hell of a big tank for a 500cc machine and it takes some clever work to give it the right look for a café racer application. Thankfully the Wrench Kings knew exactly what they were doing and utilised colour and some careful little tricks to bring the whole thing together. Like many Honda’s of the early ‘80’s the GL tank features rear edges designed to meet the factory side covers, ditching the body work can leave a strange look but by using the same black on this part of the tank as the frame the Kings have achieved a far more flowing look than most. The rest of the tank features white and silver in a combination of rounded and square shapes to break up the tanks side and like all Wrench King bikes their logo takes pride of place. Sitting on the new subframe is a custom café seat in black leather with white tubing and is generously padded for long days in the chair. The Guzzi-esque 500cc developed by Honda for the CX500 was quite revolutionary for its time; No Kickstart, V-twin but 4 valves per cylinder, CV carbs tuned for improved emissions and by the time it was fitted to the GL series it had received transistorised ignition and longer intake runners for a cleaner look and more low down torque. The Kings gave their little twin a thorough make over and rebuild ensuring thousands of trouble free kilometres to come and it looks the business all in black. The exhaust utilises the factory headers which have been heat wrapped, while the standard collector is ditched along with the big factory cans. In their place are a pair of chrome hotdog style mufflers and the GL now sounds like a B52 swooping down on a low flying bombing raid! With the airbox ditched the tuned CV carbs now breathe through chrome pod filters that draw fresh air from the massive space below the seat. A stripped down, lightweight and suitably grunty GL deserves to handle much better than the comfortable, but wallowing factory setup. With the more popular CX, many have simply lowered the front forks or worse, cut the standard springs which might look great but is downright dangerous. The Kings don’t make these sorts of mistakes and got it right the first time around with the fitment of a set of CBR conventional telescopic forks that come from the factory ready to handle and handle well. Not only do the CBR forks also offer tunability to preload, dampening and rebound as an added bonus they come equipped with dinner plate sized drilled rotors and big calipers for vastly improved stopping for the GL500 which was under braked from the factory. Out back the factory Pro-Link suspension remains in place and having gone on to be used on some of Honda’s greatest bikes, it’s a decision that makes perfect sense. With all that factory fairing gone a single headlight is one of the few pieces to extend beyond the chassis lines and with an LED halo it lights the way in style. The new taillight is kept small and along with the bar mounted indicators are powdered by an all-new wiring system that is fired by a lithium battery. Tidying up the front end the ignition and choke cables have been cleverly hidden under the seat and all that remains is a small digital speedo. Mounted below the CBR top clamp are a new pair of clip-ons with all new levers, master cylinder and throttle assembly in black set off by the stark white grips with LED turn signals at their ends. With that, the Wrench Kings were finished on perhaps the nicest GL500 you are ever likely to see. It looks great, it has modern suspension, stops on a dime and that torquey V-twin not only pulls hard but sounds like the end of the world doing it. The only question left, just what is going to come out of the Wrench Kings and the Netherlands next? Well, it looks like they’re working on a bratstyle CB900 Bol d’Or, a CB Nighthawk Tracker, and a Kawa Z500 café racer – more on those very soon.